A few weeks ago a story about Joy Division and New Order master tapes being rescued from the trash circulated on the 'net. The source of the story was a Facebook Page update by Julia Adamson, who was Martin Hannett's personal assistant years ago. Adamson claimed the rescued tapes were original masters and outtakes from Hannett and they had been thrown away and were unwanted. After she allegedly rescued the rarities she attempted to reach out to members of New Order and record companies to see if they wanted the tapes, but at the time she claimed no one involved, including Peter Hook, wanted the tapes. To be honest, something about the story didn't seem legit, or at the very least, we didn't seem to be getting the full story - after all, if the tapes in question were indeed original masters (one recording was alleged to be the original masters of Unknown Pleasures), why WOULDN'T New Order or any key players want to regain control of these historic tapes? 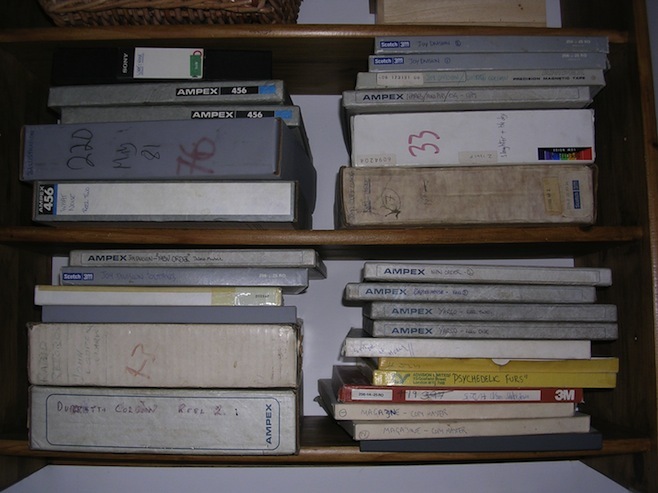 "I must admit that we’re absolutely delighted that these tapes have been rescued. There is no way on earth that I, renowned collector of all things Joy Division and New Order, would have not been interested." "The band owned the copyright and the music, and under English law it’s illegal to give away people’s music without their consent. So, if Julia did want to give them away, she needs our permission." Hook hopes eventually to be able to commercially release some of the contents from the tapes as some kind of Joy Division outtakes/alternate mixes collection. The situation may be muddled a bit due to the ongoing Hook/New Order legal battle, but at least it's nice to know the tapes are legit and they will soon enough be in the custody of someone who helped create them. Read the full update over at Pitchfork. Meanwhile, Peter Hook is preparing to come to North America for his Movement/Power Corruption & Lies tour. Ahead of the tour Hook was interviewed by the Dumbing of America and talked about those first two New Order albums. The interview is a great read especially for fans of New Order's early material. Read the interview here. Don't miss Peter Hook on tour in North America this September. Dates are posted below. Chicago fans should also note that today a Riot Fest after show featuring Peter Hook will take place September 15th at the Double Door. Hook has confirmed the after show will be a New Order Movement/PCL set (Hook's set at Riot Fest will be a Joy Division set).